While Asian Week now says that its editorial process is “under review,” how did they even hire someone like Eng in the first place? As the editors of SFist have proven, an online search of Kenneth Eng provides plenty of evidence that he is at worst a racist – or at best extremely angry and unstable. In an age of Google searches, the editors of Asian Week had simply no excuse to not know whom they were dealing with. Eng was a symptom of a larger problem, and more questions need to be answered before the paper regains its reputation in the community. In August 2004, Eng recounted in an online webzine his experiences at NYU where he encountered “anti-Asian discrimination,” and was ostracized for his provocative views. But he never elaborates in the piece what his actual opinions were, besides “Hitler was not a coward” and that African-Americans receive “unfair assistance.” While opposing affirmative action is not necessarily racist, anyone who reads the article can tell that Eng has a serious chip on his shoulder, and that his rhetoric could easily descend into hate speech. But the most disturbing part of Eng’s writings is a website that he created called “Yellow Skull” – where he urges Asian-Americans to unite against blacks and whites, and to “finally make those big-eyed fuckers suffer.” He calls both white and black people “the enemy,” glorifies Asians who have killed whites in self-defense, and says that white people “deserve” to be decapitated. I don’t recommend viewing the site. Besides his racist views, Eng has problems with telling the truth – not a hallmark of responsible journalism. He repeatedly calls himself the “youngest published science fiction novelist in America,” although it’s factually incorrect and the book that he wrote was self-published. And like Peter Ragone, Eng got busted in November 2005 for posting comments on a website about science fiction novels – where he gave rave reviews about his own book by using a fake name. I don’t know what Asian Week knew about Eng before they hired him – Samson Wong never called me back although I called and e-mailed him with questions. But assuming they were merely negligent for not doing a Google search, their behavior became reckless when Eng started writing for the paper. In the past several months, Eng wrote two columns, “Why I Hate Asians” and “Proof that Whites Inherently Hate Us,” that contained enough rhetoric to put any responsible editor on notice. Asian Week allows readers in its online version to post comments about articles on a moderated response board, but that “comments using inappropriate language will not be posted.” When readers posted critical comments about his November 24th column, Eng replied on the message board in part by referring to black people as “darkies.” If a racial slur is not “inappropriate language,” what is? According to Kamisugi, some panelists at the forum even implied that to call for further redress from Asian Week was like beating a dead horse. But it’s not enough just to say you’re sorry and to get rid of a racist columnist. Asian Week had plenty of opportunities to realize that Kenneth Eng had no business at their newspaper – or any publication for that matter – and the fact that they let the problem fester needs to be examined. For starters, Asian Week needs to be upfront about who was responsible for approving Eng’s column. There’s a critical difference between exposing the community’s “disturbing warts,” and giving a mouthpiece to racist bigots. 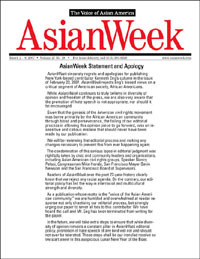 Asian Week must explain the details of their editorial process, and what specific changes are going to be made.